My professor in Japan gave me a Shakuhachi. For a long time I have thought of playing a Japanese instrument Shamisen, which is, however, expensive and big even though it can be folded up. As it seemed not easy to bring it with me while traveling abroad, I couldn't have decided to start it. Then recently, I was communicating with my professor after several months' silence, and I asked him incidentally "are your continuing your practice of Shakuhachi? I'm interested in it too". 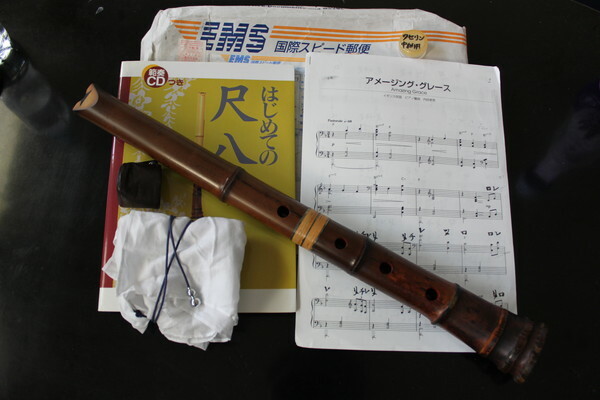 He answered me "I'm doing it, and I can give you one", then after some days, a Shakuhachi arrived at my home, in Versailles. No sound comes out !! No sound comes out, at all. It was mentioned in the email from the professor, but it is already difficult to sound it. Diiiiiiifficult. But when it sounds, it's already beautiful. So I will practice it well, and would like to play in the garden of Versailles.